by Brianna Crandall — January 23, 2019 — As thousands enter the workforce, there were 43 fewer workplace fatalities in 2017 (5,147) than in the previous year (5,190), according to the Bureau of Labor Statistics’ National Census of Fatal Occupational Injuries in 2017 (CFOI) report released in December. The fatal injury rate also decreased from 3.6% per 100,000 full-time equivalent workers in 2016 to 3.5% in 2017. However, some types of injuries as well as certain occupations, including several related to buildings, experienced increases in 2017. 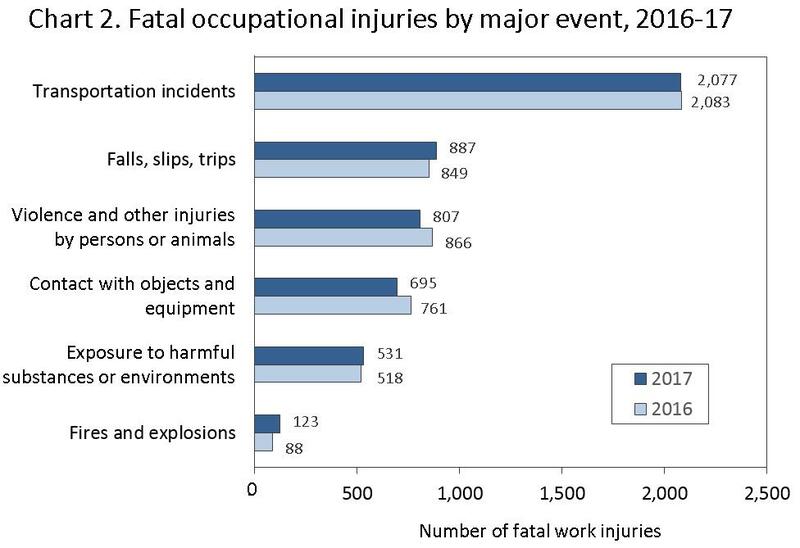 Workplace fatalities graphic courtesy of BLS. Click to enlarge. Click to enlarge. Fatal occupational injuries in the private manufacturing industry and wholesale trade industries reached their lowest points since the CFOI started in 1992. The transportation and material-moving occupational group and the construction and extraction occupational group accounted for 47% of worker deaths in 2017. Within the occupational subgroup driver/sales workers and truck drivers, heavy and tractor-trailer truck drivers had the largest number of fatal occupational injuries with 840. This represented the highest value for heavy and tractor-trailer truck drivers since the occupational series began in 2003. Grounds maintenance workers (including first-line supervisors) incurred 244 fatalities in 2017. This was a small decrease from the 2016 figure (247) but was still the second-highest total since 2003. A total of 36 deaths were due to falls from trees, and another 35 were due to being struck by a falling tree or branch. A total of 91 roofers died while doing their jobs in 2017, as did 30 refuse and recyclable material collectors, 14 structural iron and steel workers, and 26 electrical power-line installers and repairers. While today’s report shows a decline in the number of workplace fatalities, the loss of even one worker is too many. Through comprehensive enforcement and compliance assistance that includes educating job creators about their responsibilities under the law, and providing robust education opportunities to workers, OSHA is committed to ensuring the health and safety of the American workforce. Employers who need assistance in meeting their safety obligations can take advantage of OSHA’s no-cost and confidential On-Site Consultation Program, which provides valuable services for job creators that are separate from enforcement. OSHA Training Institute Education Centers (OTIs) also provide training to workers, employers, and other safety professionals across the nation. For BLS’s National Census of Fatal Occupational Injuries in 2017 (CFOI) report announcement or complete Current and Revised Data, along with static and interactive graphs and videos, visit the BLS website. For more safety and health regulatory and compliance information and assistance, visit the OSHA website, particularly the Safety and Health Topics pages. The American Society of Safety Professionals (ASSP) website offers additional resources, and Cleaning & Maintenance Management (CMM) magazine offers Health & Safety news and resources, including the “Raise Expectations for High-Level Projects” article on fall safety for facilities and custodial crews and contractors.